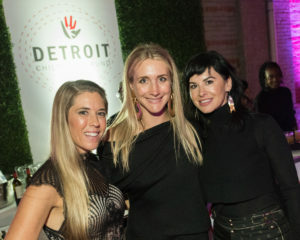 DETROIT – More than 240 guests were taken back to school when they attended the Detroit Children’s Fund Inaugural Dinner on Saturday, October 14 at The Factory at Corktown in Detroit, MI. The raw venue was transformed with a school theme, complete with notebook-patterned table tops, giant pencils, and a school lunch inspired dinner menu. Thanks to the generous support of sponsors and attendees, the event raised more than $1.55 million. DCF board member Adam Levinson and his wife Brittany generously contributed $775,000 of the total raised in a matching gift challenge. All funds raised will support the Detroit Children’s Fund quality seat campaign to create 25,000 seats for K-12 students in strong Detroit schools by the year 2025. The Inaugural Dinner Event Chairs were Ashley Crain, Gretchen Davidson and Kelle Ilitch. Davidson and Ilitch also serve on DCF’s board of directors alongside Tonya Allen, Pernilla Ammann, Phil Cooley, Tiffany Douglas, Bill Emerson, Carol Goss, Adam Levinson, Ryan Maibach, Jacques Panis, Arn Tellem, Jason Tinsely, and Board Chair KC Crain. In addition to the funds raised at the Inaugural Dinner, DCF’s Executive Director, Jack Elsey, announced a $2-million grant from General Motors. GM was also a presenting sponsor of the dinner, alongside Tom and Holly Gores. Inaugural Dinner Presenting Sponsors were General Motors, and Tom and Holly Gores. Hometown Match Sponsors were Brittany and Adam Levinson. Executive Sponsors were Linda and Ed Levy, Jr. Dinner sponsors included AVL Americas, Barton Malow Company, Crain Communications Inc, Gretchen and Ethan Davidson, The Detroit Pistons, Marlene and Bill Emerson, Gallagher-Kaiser Corporation, Ilitch Holdings, Kojaian, Lear Corporation, Quicken Loans, and Arn and Nancy Tellem. The event’s Media Sponsor was Crain’s Detroit Business. Event photos are available on DCF’s Facebook page.